It's never too early to start thinking about the holidays! Here's a quick look at this year's holiday offering from China Glaze, the Let It Snow Collection. Twinkle Lights shall be mine! Wow, Holiday collections already! And by the time is it the holidays we will already be look towards summer again! I really enjoy these greens, although, I probably will try to score the rest. I think the holiday collex are my weakness. OH EM GEE! Can't wait! I'm already making some room in my second Melmer specially reserved for Snow globe, champagne bubbles, and twinkle lights. I like Twinkle Lights,too,along with Poinsettia,and Glittering Garland,and Blue Year's Eve! At this stage I think I'm only a fan of Twinkle Lights and perhaps Snow Globe. 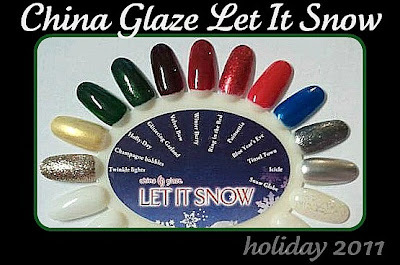 I love them, especially the greens, but I wish they'd come out with a couple of different colors for the Holidays. There's always silver, white, gold, green, red/burgundy, a plum, and a med to dark blue included, but I want something new. Don't ask me what, because I'm not sure right now, but just something unique. I will look forward to the CG Holiday shades since OPI is not doing a holiday collection again this year...instead they are sticking to another movie release with a Muppets collection that will be looking a lot like Burlesque of last year with 6 creams/shimmers (2 are totally dumb basic gold and one in silver - boring). The other 6 in the collection from OPI will be all glitters just like the division was in Burlesque collection. Since I tend to think often the holiday collections bring us some of the best shades and I have seen the Muppets collection and am not a fan at all, I am glad CG is sticking to a more traditional holiday blend of shades. Not easy to tell from the graphic representation what really they will look like - have to wait for the bottle shots and swatches. But I am sure I will buy a couple of them.